I wanted to do a Christmas themed eyeshadow tutorial and it was a bit of a no-brainer which colour to pick.. It’s got to be Mac’s Cranberry eyeshadow… Could any other colour be the heroine of this look? 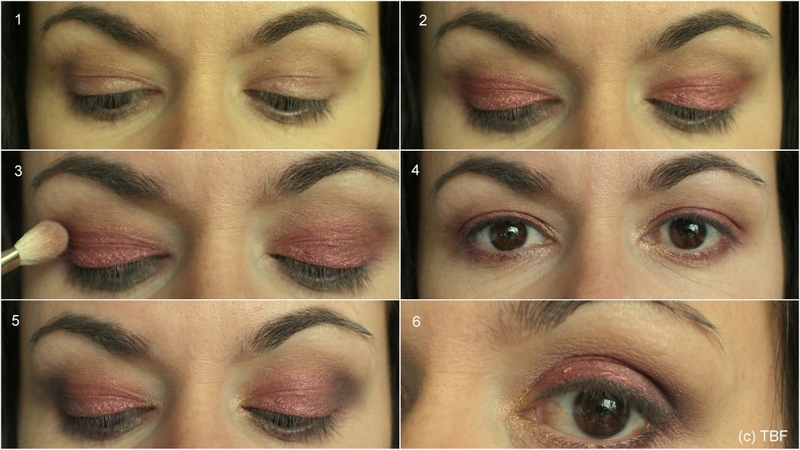 Eyeshadows: Mac Cranberry eyeshadow. From my Urban Decay Naked Palette I used a mix of Naked and Buck in the crease as transition colours. 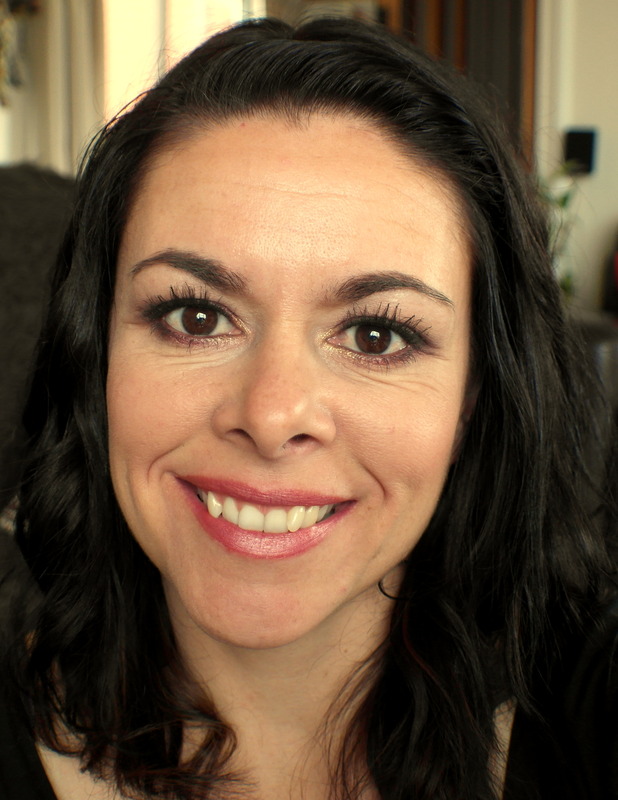 I also used Half Baked (gold colour) in the inner eye corner, Creep (black) in the outer corner of the eye and, lastly, Virgin (a shimmery creamy shell colour) as a brow highlight. A lipstick of your choice. I tried two, both from Jordana. The soft Pink one is called Soft Rose, but I preferred the brighter red one, Cranberry Mix. These lippies are great value at NZ$4.50 and are available widely from $2 shops! Step 1: Apply cream eyeshadow and crease colour – Using your finger apply the Pomegranate Punk cream eyeshadow all over your eyelid, applying it slightly past your eye crease/socket. Pomegranate Punk will intensify the colour of the Cranberry eyeshadow and it was also act as a primer so your eyeshadow will last all day and not crease! Then, using a soft fluffy brush, apply a matt brown colour to your eye socket/crease (I used a mix of Naked and Buck eyeshadows from my Naked Palette). Extend this matt brown up above your crease up about halfway towards your brow bone. Blend well, quite softly, going backwards and forwards in a window wiper like motion to blend away the edges of the Pomegranate Punk. 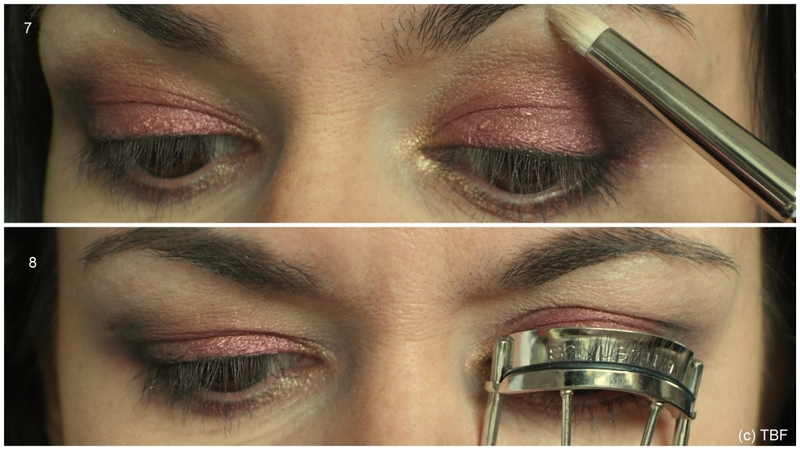 Step 2: Cranberry time – Using a flat stiff brush apply Mac Cranberry on your eyelid, stopping at your eye crease. Really pack this colour on so it’s nice and vibrant! Tip: If you use a damp eyeshadow brush the colour will apply really bright (I did this so it would show up well in the photos but also as I like the pretty metallic effect it gives). Step 3: Blending time – Using a fluffy brush blend the top edge of the Cranberry eyeshadow, so Cranberry blends seamlessly into the mid matt brown colour. Again, move the brush softly in a window wiper like motion. Step 4: Lower lash lining – Using a small detail brush, apply the Cranberry eyeshadow to your lower lashline starting from the outer eye corner but stopping about half way along. 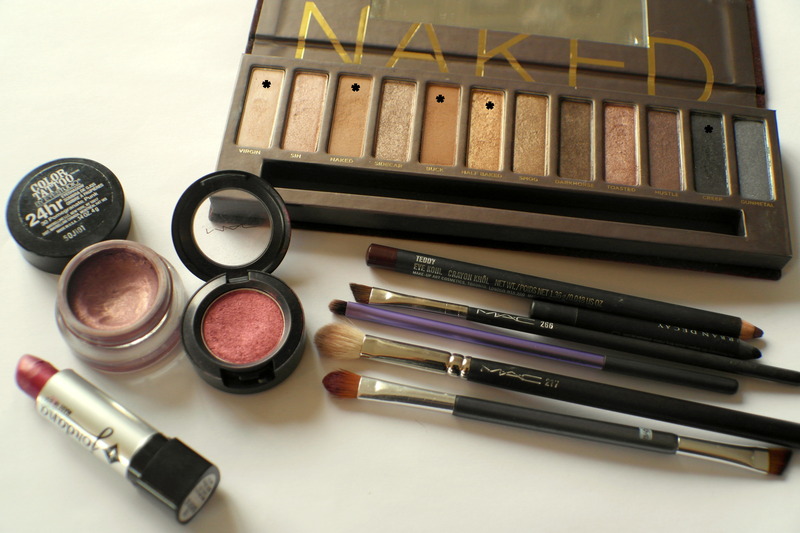 Clean off your brush then apply a gold coloured eyeshadow in your inner eye corner (I used Half Baked). 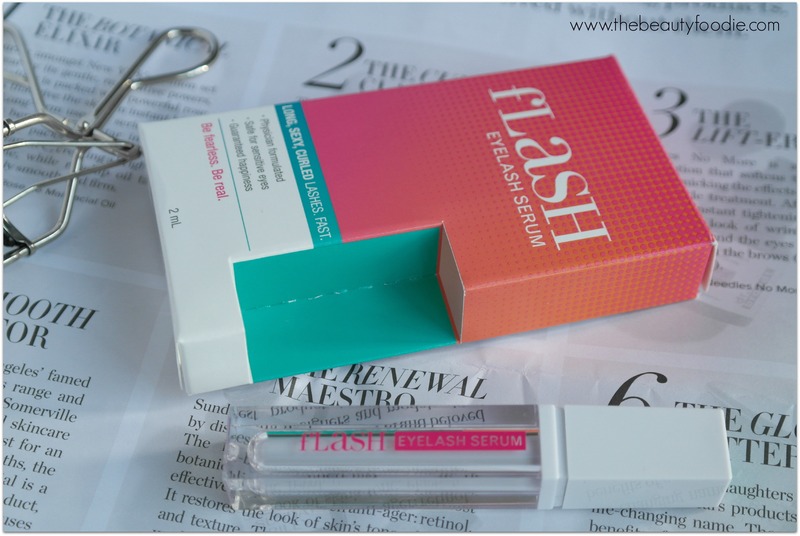 Also apply it on your lower lashline from your inner corner along until it meets Cranberry. Step 5: Outer v – Using your fluffy brush again (clean it off on a tissue) dab a teeny bit of Creep just to the outer v of your eye, on top of Cranberry. Move the brush in a tiny circular motion to blend it. Step 6: Apply eyeliner. :Using a fine eyeshadow brush (I used a Mac 266, angled brush) pick up some black eyeshadow (I used Creep from my Naked Palette). Apply this along the top lashline like you would an eyeliner (you can use an actual eyeliner, I just like the soft effect achieved by using an eyeshadow). Also apply a tiny bit of the black eyeshadow to the lower lash line, e.g. 1/4 of the way in, on top of the Cranberry (this way the black runs along the top of your upper lashline and then it connects with the lower lashline). Step 7: Apply brow highlight – Using a clean brush apply a light cream colour to your browbone. I used Virgin from my Naked Palette. Step 8: Curl your eyelashes (optional). Then apply oodles of mascara (at least two coast). 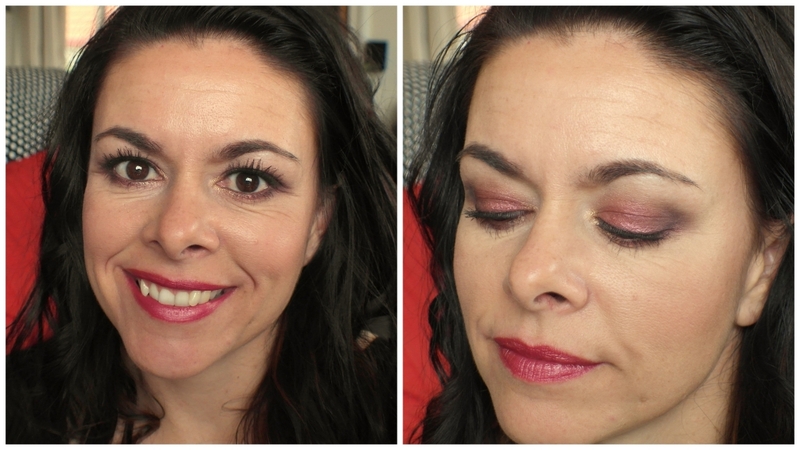 I played around with different lipsticks when I was doing this look, my favourite was Jordana’s Cranberry Mix, a stunning deep red/cranberry colour with a frost finish. The Soft Rose (also by Jordana) was nice, but much less dramatic (what can I say… I like drama!). So, would you wear this? Have you tried it? Let me know what you think! Merry Christmas! DIY Body Scrub – Great gift idea!